My guess at the the number of levels – 136 – has been confirmed. 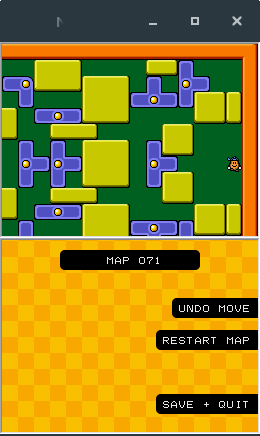 I managed to find a newer version of the Nintendo DS game ‘PuzzleBoy’ – 1.10. rather than 1.04. This had a read me file which states the game has 136 levels and more usefully, the source of the additional levels. PuzzleBoy is a not a direct clone of Kwirk. While it uses the levels, they are interspersed with other levels that I assumed had been written by the author of the DS version. It turns out though that they are from Amazing Tater (a sequel to Kwirk on the Gameboy) and PuzzleBoy, a version of Kwirk for the PC Engine. Hitting the wall(s) on Level 71 on the DS. Level 71 on the Spectrum. This proved rather helpful in getting me past level 71 which I had been stuck on for a while, as I found and downloaded walkthroughs for Amazing Tater and Puzzleboy. I then managed to track down which game the level was from and then used the solution to complete the level. 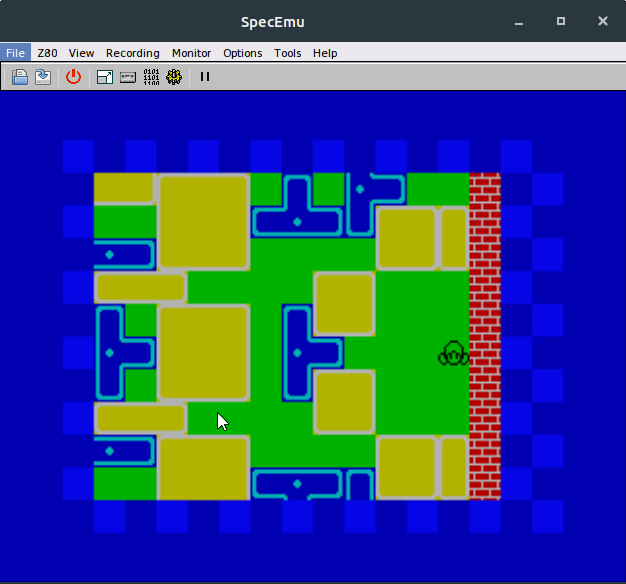 I couldn’t figure out a way to auto convert the levels from the DS so I’ve been adding them in one at a time as I’ve been progressing through the game – which is why they’ve been added in spits and spurts. Added levels 71 to 82. Swapped the Restart and Map options around in the break menu. Made the code entry screen look similar to the level info screen. Added support for blocks greater than 1 x 1 starting over a hole. Needed for level 74. I think this is an enhancement from Amazing Tater as Kwirk doesn’t appear to have blocks or switches starting over holes. Fixed a bug creating a block when you had two n x n blocks on the same y axis. Spotted on level 71. The initial switch position on level 12 was incorrect.